I've had a need to bake and create desserts in the last couple of weeks. Even while preparing for hubby's bday party... and even after it was all done... I still wanted to make desserts. Take this Chocolate Banana Pudding Cake, for instance. I've made it three times this week! (much to hubby's delight... and it wasn't even his birthday cake). Going off-topic for a moment, I forgot to take a pic of the bday cake. I used the All-Purpose Vanilla Cake from ed&bv for the layers, and I frosted it with two things - a new chocolate ganache that is silky and velvety and rich, and then, I got experimental and also made a raw orange cream frosting. Now, chocolate and orange are one of my favorite combinations (and I also love the combo in these cookies). So, I put a layer of the raw orange cream frosting in the centre and top of the cake, and covered everything with the chocolate ganache. I will have to recreate the recipe, just to show you a picture of this cake! Getting back to the pudding cake. 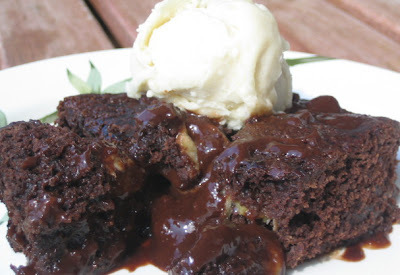 Ihad a memory of making a chocolate pudding cake years back during the 'low-fat' time of the early 90's. I'm sure some of you remember that enchanting food era. Everything was made with wads of refined flour and sugar, but no oil or other fat. The only redeeming quality about some of the baking is that fruit purees like applesauce were used to replace the oil... but so were egg-whites. I remember making a brownie recipe that used about 6 or 8 egg-whites. Ugh. Makes me gag to think about it now. Wow! I'm really all over the place in my post today, aren't I? Now you have a glimpse into having a chat with me - ha! Well, it's been a while since I've talked with you all, so I have a lot to say!! Anyhow, again, back to the pudding cake. (I've decided to keep adding different photos to remind you what this post is really about!) I got to thinking about that low-fat pudding cake, and how much I loved that layer of molten chocolate bubbling underneath the cake when it was baked. You can spot a little pool of sauce oozing through the cake layer in this pic, see it, around the lower left corner? And, I loved how that pudding-ish layer was still insanely good even when the cake had cooled. But, make no mistake, this cake is definitely best still warm, and with a little scoop of vanilla ice cream to melt into the crusty cake layer and meet up with the chocolatey sauce. A couple more tests to go on this one, and then I may do a call for some testers for my recipes, since I know many of you are eager to try some of the new dishes I've posted. Now, what will I bake today? So many choices! Vegan baking is grand! I love the choco-orange combo too. At Christmas time, when boxes of Ganong Delecto (how Canadian) get passed around, I seek out the orange cremes. Maple cremes are a close second. Mmmmm. Hubby's cake sounds delicious! And that pudding cake?! Oh boy! Tester? May I submit my resume? I do have previous tester experience. ;o) Gimme a shout. Pudding and cake together in one dessert? Gosh, that along with the combo of chocolate and banana sounds deadly! 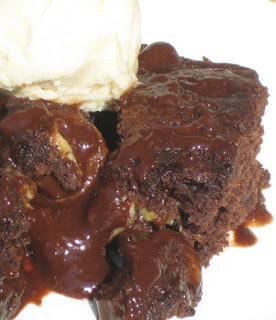 Bubbling molten chocolate?! Woooah, sounds like a knock-out. Oh Dreena, how I would love to try your pudding cake... It sounds like an amazingly rewarding baking project! It must be pretty darn good if you've already made it three times this week. YUM!!! This looks so luscious! Wow. I think I need that ASAP. Mmmm, that cake looks SO chocolicious and wonderful! My tummy is telling me that I must be a tester! That pudding cake looks amazing! Mmm..that cake looks so rich and delicious. My mouth is watering! You can never have to much chocolate!! The pudding cake looks so ... chocolaty! I'm willing to be a tester too. this post cracked me up, dreena! that cake looks beyond delicious. i will test this recipe in a heartbeat. chocolate and bananas is one of those combinations that is meant to be... especially when it's in the form of a moist, rich cake. I'm drooling right now. DROOLING!!! I'm trying not to eat too many sweets. You're making it very, very difficult, Dreena. Hi Dreena! Your pudding cake looks wonderful! I am still cooking your recipes and my family is asking for more. I will be driving from Florida to Connecticut in Nov for the holidays. I will have to show my mother how to cook vegan and she is all for that! A new recipe to test would be major cool!!! It is wonderful how my family asks for me to make them vegan meals when they are not vegan. Verrrryyy tricky!!! There aren't enough words to explain how delicious that looks. ah, yeah. so you know i want to be a tester, right, LOL?! i'll be a tester if you still need people!! i'm in edinburgh, scotland now, and i'm in self-catered housing where i do my own shopping and cooking...and i only brought one cookbook with me...guess which!! ED&BV!! Oh I can not wait for this recipe! I have dreamed of making a dessert just like that. I'd love to test it out, I say drooling. I also made an chocolate orange cake for hubby's b-day. Chocolate layers with chocolate orange frosting and orange zest between the layers. Cake was then smothered in chocolate frosting. It was a hit! Oh my goodness. That looks so crazy phenomenally good. Are you calling for testers for this? Pretty please, can I fill the job?! Holy hannah banana, that needs to be in my belly! Wow, so many enthusiastic testers!! I always get you with the desserts - and chocolate - huh?! Thanks for all your excitement, once I get organized for testing, I'll let you know. Thanks everyone... you're all very sweet. Your cake looks amazing! I am still in search of my dream vegan chocolate cake and this might be it. I love the combination of bananas and chocolate. ED&BV is my FAVORITE cookbook! I just made your Sweet & Sour Chipotle Tempeh and Sweet Potatoes last night. We LOVED it!! Eric and I both took it for lunch. I have another portion in the fridge to eat in a couple of days. It was delicious. I swear, I've never made anything from ED&BV that we haven't loved. We especially love all of the burritos. I made the roasted tamari Chickpeas this past weekend too. So amazing! I still have to post about all of these dishes. So...you can always count me in as a recipe tester, if needed. :) Thanks for all you do in bringing wonderful, vegan recipes into our lives.